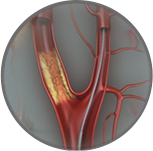 Endovenous Laser Therapy is a minimally invasive laser procedure performed here in the Specialist Vascular Clinic. It is used to treat varicose veins and venous insufficiency involving the great and/or small saphenous venous systems in the legs. The energy from the laser damages the walls of the veins, which effectively closes the refluxing (insufficient) vein. This procedure takes approximately one hour to perform, and the patient can resume normal activities the same day. 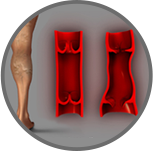 Clinical trials reported in the medical literature have shown it to have the best success rate of any procedure available for the treatment of large varicose veins – up to 99% success rate after two years and 98% after 5 years. It is best suited to varicose veins greater than 6mm in diameter that are straight and not close to the skin surface. As not all varicose veins are suitable for laser treatment a Duplex ultrasound scan is performed after your initial consultation to map the leg veins to determine the direction of venous blood flow and the extent of the problem. Following this it can be determined if your leg veins are suitable for laser treatment. The procedure is performed under local anaesthetic in our office in St Leonards. The local anaesthetic allows the procedure to be performed safely in the office and has several benefits. Firstly, the vein is totally numb resulting in no pain during the lasering. Secondly, the anaesthetic that is placed around the saphenous vein causes the vein to spasm down onto the laser fibre resulting in the vein being in close contact with the fibre. Thirdly, the local anaesthetic acts as a heat sink – it absorbs and dissipates the residual heat from the lasering which prevents thermal damage to tissues surrounding the treated vein. The first step of the procedure is to place the local anaesthetic under the skin. Then a small needle is placed into the vein under ultrasound guidance. Through this needle a fine wire is passed into the vein to be treated and the needle removed. A fine catheter (which is a small plastic tube) is directed over this wire and threaded up the vein so the laser fibre can be inserted through it to where treatment begins. Then the entire length of the vein being treated is bathed in local anaesthetic before turning the laser machine on. The vein is then treated with the laser as the fibre is slowly withdrawn down the leg. While large, obvious varicose veins shrink dramatically after the laser treatment it is the vein higher up in the leg and not visible externally (but the source of the abnormal blood flow) that is particularly suited to the laser therapy. There is a risk of thermal injury to the skin if varicose veins close to the skin are treated by laser. The varicose veins below where the laser treatment is performed are treated by injection sclerotherapy immediately following or several weeks after the laser treatment. The laser therapy causes a greater but more controlled injury to the vein wall than can be achieved by ultrasound guided sclerotherapy (UGS). Consequently the success rate is higher with laser therapy for large veins. The laser fibre is flexible but too rigid to be threaded along tortuous varicose veins. The vein takes time to shrink to a smaller, permanently sealed structure. This process takes months and is monitored by ultrasound examinations at follow-up appointments. Hence, the review appointments are important to ensure a good long term result. The procedure takes about an hour and you are able to walk out and drive home afterwards. The vein is checked by Duplex ultrasound at 1-2 weeks, two months and six months. It generally takes 3-6 months (depending on vein size) to fibrose down to a small remnant that physically cannot recur. This is determined by the ultrasound appearance. Note that good cosmetic improvement occurs well before this time. You will be asked to sign a consent form for the procedure. The leg is commonly treated from the skin crease of the groin to the ankle and needs to be accessible. 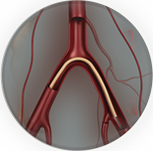 This enables effectiveness of the procedure to be assessed along the entire length of the veins to be treated. Moisturizer on the skin does not affect the treatment. If you have problems contact Specialist Vascular Clinic to seek professional advice and/or arrange for a specialist consultation.